It’s Secret Recipe Club reveal day again. This month I was assigned Sustainable Cooking for One. 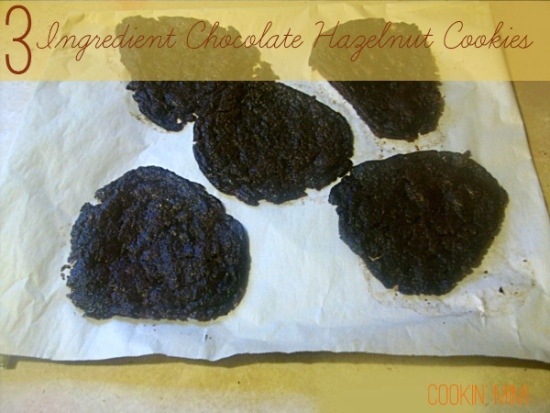 When I saw the recipe for Chocolate Hazelnut Butter Cookies I knew exactly what I was making. The only difference I made in the recipe was to use Nutella instead of a natural chocolate hazelnut butter. The nearest decent sized health food store or grocery with a large natural/health foods section is about an hour away and that’s a bit too far to drive for one ingredient. These are a very sweet and crisp cookie. Rich chocolatey cookies that only take three ingredients and a few minutes to make. In a medium sized bowl stir together the chocolate hazelnut butter and sugar until well combined. Add the egg and beat well. Drop by teaspoons of dough onto parchment lined cookie sheets, allowing plenty of room between cookies. Bake for 8-12 minutes or until set. Cool on sheet for 2 minutes then remove to cooling racks to cool completely. How fun to be able to make some cookies so quickly. What a fun idea! I always like recipes like this where you can make something even if your pantry is pretty empty. These look so tasty! I loved searching your site for recipes….and now I am obsessed with your family’s chicken tortilla casserole! Nutella and sugar – no wonder they were sweet. There’s no way I would have made the trip either. Great save! I’ve actually used mail order from a certain giant online retailer for certain “health” food things, mostly whole grains, but it might work for nut butters too. They’re a bit less sweet and heartier when you use the natural version. Glad they worked well for you!